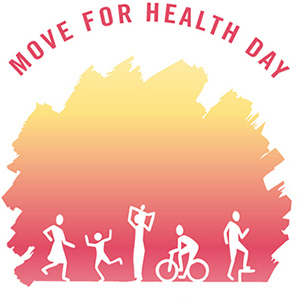 Move for Health Day, an annual global initiative to promote physical activity sponsored by World Health Organization (WHO), with broad links to communities around the world, formally got underway on Saturday (May 10, 2003). The initiative was called for by WHO Member States following the success of last year’s World Health Day on the Move for Health theme. Member States have been urged to celebrate a Move for Health Day each year to promote physical activity as essential for health and well-being. The timing of events has been left to the discretion and resources of individual countries. Last month, the Brazil-based Agita Mundo Network helped organize more than 2,000 Move for Health events in 28 countries. Canada is linking its SummerActive 2003 Campaign (9 May-21 June 2003) to Move for Health Day to help populations build physical activity into their daily lives. As part of the European Healthy Cities Network, cities in 11 European countries will organize the Campaign "Day of Dance" (10-17 May 2003). Pakistan organized a national seminar this month to launch the Move for Health Campaign and its National Action Plan for the Prevention and Control of Noncommunicable DIseases. Poland is pursuing its national campaign "Putting the Heart on its Feet" this month. And later this year, various other campaigns involving WHO and its partners will be linked to Move for Health Day 2003, such as the Global Embrace, which every October organizes events to promote active aging. WHO and its partners hope to establish Move for Health Day, both as an overall concept, and as part of a larger sustained initiative for a range of events and activities to encourage regular physical activity for health and wellbeing. WHO Director General Dr Gro Harlem Brundtland, MD, said the globalizing of the initiative reflected Member State concerns that the increasing chronic disease problems caused by unhealthy diet and physical inactivity should not be addressed in isolation. Move for Health is part of a broader WHO move to address the growing burden of chronic diseases through its Global Strategy on Diet, Physical Activity and Health, which is being prepared for presentation to Member States in May 2004. These initiatives are strongly backed by findings of the 2002 World Health Report, which lists Physical Inactivity among the main risks contributing to global chronic disease morbidity and mortality, especially unhealthy diet and tobacco use. Overall, chronic diseases now account for 60% of premature deaths annually. Physical inactivity is estimated to cause 1.9 million deaths (in 2000) and 19 million disability adjusted life year (Daly) losses annually, and about 15-20% of cases of ischaemic heart disease, diabetes and some cancers. Worldwide, it is estimated that over 60% of adults are simply not active enough to benefit their health. The risk of getting a cardiovascular disease increases by up to 1.5 times in people who do not follow minimum physical activity recommendations. "Changes in physical activity, diet and in the environment following rapid globalization and urbanization pose increasing challenges," says Dr Brundtland. "Largely preventable chronic diseases such as cardiovascular disease, stroke, diabetes, cancers and respiratory diseases – as well as obesity and overweight problems – are now the major causes of death and disability worldwide. And they are rapidly spreading throughout the developing world." Encouraging Move for Health activities is "everybody’s responsibility," says Dr Brundtland, and needs appropriate support from government and development sectors and civil society. The solution to producing health, social and economic benefits from physical activity to population groups, men and women, of all ages and conditions including persons with disability, is simple; 30-to-60 minutes moderate-intensity physical activity daily. Greater benefits come from doing more vigorous activity for longer periods. Dr Pekka Puska, WHO’s Director, Noncommunicable Disease Prevention and Health Promotion, says that strong national and local political commitment and support is an essential prerequisite for strengthening and sustaining Move for Health at the country level. "Governmental agencies and development sectors, civil society including NGOs, political and professional organizations, relevant private sector and all other concerned stakeholders within society have a role to play in support of the Initiative," he says. "Physical activity is a strong means for individuals to prevent serious disease, and a cost-effective way for societies to improve public health." WHO is encouraging a wide range of activities, from formulating local and national policies and strategic plans to increase population participation in physical activity and sport for all; to raising public awareness about priority issues related to health and development; to promoting physical activity among young and older people, women as well as men, and people with disabilities. All Member States have been formally notified of the initiative and provided with a backup material. A variety of information, including fact sheets, posters, country actions are also available electronically on this website. Move for Health activities can include organising walking, cycling and leisure sport campaigns in the community; promotion of streets free from cars; development of parks and open spaces where people can practice enjoyable physical activities, and including physical activity programmes in health institutions as part of integrated interventions with information on healthy diet and lifestyles. Physical activity interacts positively with strategies to improve diet and discourage the use of tobacco, alcohol and drugs. These include campaigns such as WHO and its partners’ Tobacco Free Sports, which helped eliminate tobacco sponsorship from the 2002 World Soccer Cup, the 2002 Salt Lake City Winter Olympic Games and a number of other major international sporting events. Physical activity also helps reduce violence, enhances functional capacity and promotes social interaction and integration. However, increasing physical activity is a societal, not just an individual problem and demands a population-based, multi-sectoral, multi-disciplinary and culturally relevant approach that takes into account educational, sport, health, urban planning, cultural, transport, recreation as well as other environmental and development factors.